For many, a trip to the family dentist is just a part of life; for others, it’s something that they dread and run from. At Beverly Hills Smiles, we understand that a trip to the local dental clinic can be incredibly stressful for many people. Whether it’s because you had a bad experience in the past or because it’s been awhile since you’ve been in for a checkup and you’re afraid of what they might find, being fearful of a trip to the dentist is something that we can understand. The good news, however, is that when you visit us, you’ll find that our biggest goal is to put you at ease. With a team that’s dedicated to going above and beyond for each and every one of our patients, we make it a point to provide exceptional care at every step of the way. In others words, you can trust that we’ll be doing our part to help you remain calm throughout your appointment. But what can you do for yourself? We’d like to share a few tips to help keep you relaxed in today’s post. If that sounds like something you’d benefit from, keep reading to learn more. It’s a technique that gets brought up often for people who are trying to relax. Why is that? Because it works! If you can manage to control your breathing, you’ll find that you feel significantly better. The reason this works is because when you’re focused on breathing, you’re taking more air into your body. The more air you have, the more your brain believes that it’s time to calm down. In the process, tension and stress often start to melt away. Another great way to relax during a visit to the dental clinic is by wearing something comfy. Imagine that you’ve had a particularly rough day at work. What’s the first thing you do when you get home? Put on some more comfortable clothing. The same idea applies here. The more comfortable you are in your clothes, the more comfortable you’ll be during your visit. So go ahead and wear your coziest sweats — we won’t judge! Is there anything exciting coming up in your life? Are you fascinated by a good book or television show? Interested in learning more about a new hobby? Have plans to decorate your home? Whatever the case may be, focusing on the things that excite you can be a great way to distract yourself from whatever else is going on around you. Allow your imagination to run wild and focus on the things that you enjoy and you’ll find that your appointment is over much sooner than you ever would have guessed. At the end of the day, the truth is that some people will have a harder time at the dentist than others. As we mentioned above, at Beverly Hills Smiles, our top priority is to keep you comfortable at all times. Whether it’s by greeting you with a smile or offering a joke or two, we’ll do our part to ensure that your time here goes as smoothly as possible. 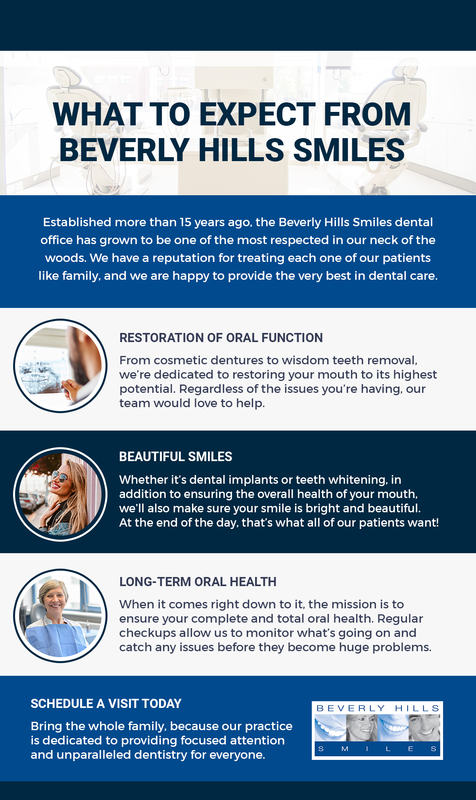 No matter what your oral health is like or how long it’s been since you’ve had a checkup, we’re the go-to family dentist in Beverly Hills for a reason. We take great pride in offering exceptional dental work with an attention to detail that is totally unmatched. Simply put, compassionate care combined with state-of-the-art equipment means that you can rest assured that you’re in good hands. Contact us today to schedule an appointment, and expect exemplary care at every step of the way. We look forward to hearing from you!